We’d love your help. Let us know what’s wrong with this preview of Radiant by Mafalda Pinto Leite. Turn your pantry into a storehouse of beauty fuel -- and you'll begin to radiate health from the inside out. From adaptogens and algae to sweet potatoes and turmeric, discover the exquisite flavors and healing magic of whole foods. In this A to Z guide and cookbook of the world’s most nutrient-dense foods, chef and nutritionist Mafalda Pinto Leite will illuminate how nature Turn your pantry into a storehouse of beauty fuel -- and you'll begin to radiate health from the inside out. To ask other readers questions about Radiant, please sign up. The photographs in this book are as gorgeous as the cover so makes a great book for any bookshelf or coffee table. This book is more than just a cookbook, it breaks down the health properties behind the food. The first part of the book deals with establishing a radiant kitchen. The second part is about the food and what makes it an essential. The last part is recipes, that look fun to make and of course to eat! From adaptogens and algae to sweet potatoes and turmeric, discover the exquisite flavours and healing magic of whole foods. In this A to Z guide and cookbook of the world’s most nutrient-dense foods, chef and nutritionist Mafalda Pinto Leite will illuminate how na I received a DIGITAL Advance Reader Copy of this book from #NetGalley in exchange for an honest review. From adaptogens and algae to sweet potatoes and turmeric, discover the exquisite flavours and healing magic of whole foods. In this A to Z guide and cookbook of the world’s most nutrient-dense foods, chef and nutritionist Mafalda Pinto Leite will illuminate how nature provides everything you need to achieve radiant health. As you follow Mafalda’s joyful “inside-out” approach, you’ll experience bountiful energy, acute brainpower, balanced hormones, luminous skin, elevated moods, and restored digestion. These transformative recipes are your guide to choosing foods with the potential to change your life. This is the latest book on the whole foods/vegan/plant-based/heal yourself with nutrients bandwagon. The book's A-Z approach makes it an excellent resource for anyone who wants to learn more about the subject. 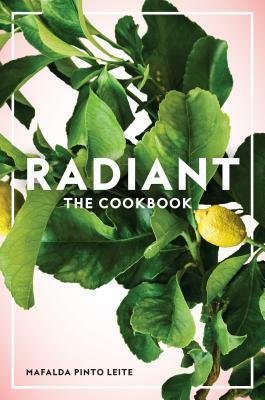 Radiant: The Cookbook is set up in 3 parts. The author begins with part one to explain the purpose behind her new release and how the rich food sources help transform your health and beauty by nourishing your body with quality ingredients. Part two was my favorite as the author broke down all the foods by explaining what vitamins and nutrients the foods are rich in and what to eat each food for, such as to reduce acne or reduce undereye circles. Part three was full of healthy, light and refreshi Radiant: The Cookbook is set up in 3 parts. The author begins with part one to explain the purpose behind her new release and how the rich food sources help transform your health and beauty by nourishing your body with quality ingredients. Beyond the best healthy, clean eating cookbook that I’ve read in a while. I started out wanting to detox and get back to a better, healthier me and this was a great place to start! However, not only did it help me start my clean eating journey, it stayed with me too! Given the chance, food can be our healing medicine and our beauty regimen in one. We just have to give it a chance. Aside from feeling better and more energetic and clear minded, but my skin was also showing a new glow. One that I h Beyond the best healthy, clean eating cookbook that I’ve read in a while. Given the chance, food can be our healing medicine and our beauty regimen in one. We just have to give it a chance. Aside from feeling better and more energetic and clear minded, but my skin was also showing a new glow. One that I hadn’t seen in years. I received a temporary digital copy of this book from Netgalley for an honest review. I'm always interested in cookbooks that have a different spin to them so when I saw Rose Quartz Latte and Sea Salad Bowl I was intrigued. There definitely are some cool recipes in here and I recommend giving it a look through just to see the pictures but I don't know if I would really make much out of it. A rainbow of healthy recipes. The recipes are easy to prepare with natural raw ingredients. Delicious and explosive! This book really is radiant. Immediately, I was attracted to the cover, the layout, the photos, and overall, the information. It's easy to digest (maybe pun intended?) and great reminders (Cut the Sugar), Focus on the Breath, Get Your Beauty Sleep). Quite often eating clean books give so much information that it's overwhelming, and I can't retain anything. The recipes are simple and memorable (my favorite so far The Detox or Glowing Skin Burger) and I'm keeping it as a resource for sure. A beautiful cookbook full of stunning photography and nutritious recipes! All recipes are plant-based, vegan and rich in superfoods. The end result is stunning foods and beverages, definitely picture-perfect and worthy of an Instagram shot!